Living in New York City was always one of my dreams. As a young girl, I was fascinated with Broadway, the bright lights, and the endless number of things to do in NYC. As a first-timer in NYC, I had no idea what I was doing! On my first full day living in New York, my aunt tried to help me get my bearings. We walked around, and in between getting jostled by the people racing to where ever they were going, I got every single one of the questions on her New York City quiz wrong. Now, having just celebrated my 20th(!) year living in New York City, there’s no denying my status as a New Yorker! 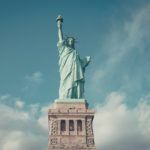 I’m also a traveler, who knows that local tips can’t be beat when you’re exploring a new place, so I wanted to pass on some tried and true local tips for your next visit to New York City. 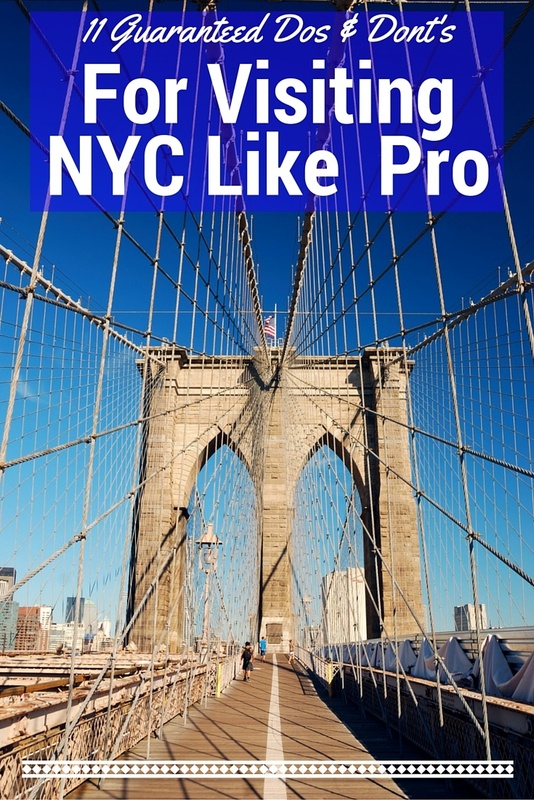 Save these NYC tips for later on your Pinterest Travel board! 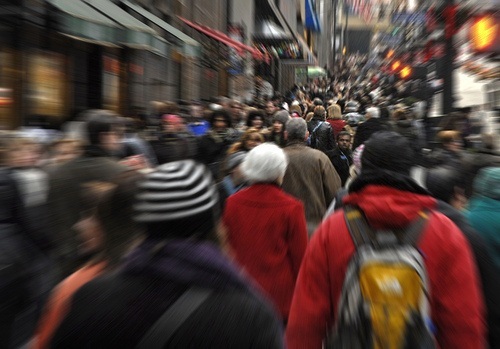 11 Guaranteed Dos and Don’ts for Visiting NYC like a Pro! Don’t stay in Times Square. For that matter, don’t stay in Rockefeller Center, either. These places are iconic, sure. Go see them, take some photos in front of the ice rink or the giant billboards with their flashing lights, and then get out of there. 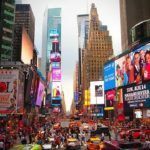 New York City has so much more to offer and, with a City Pass, you can even save money seeing all culture, history, and famous sights. Do explore other parts of New York City. 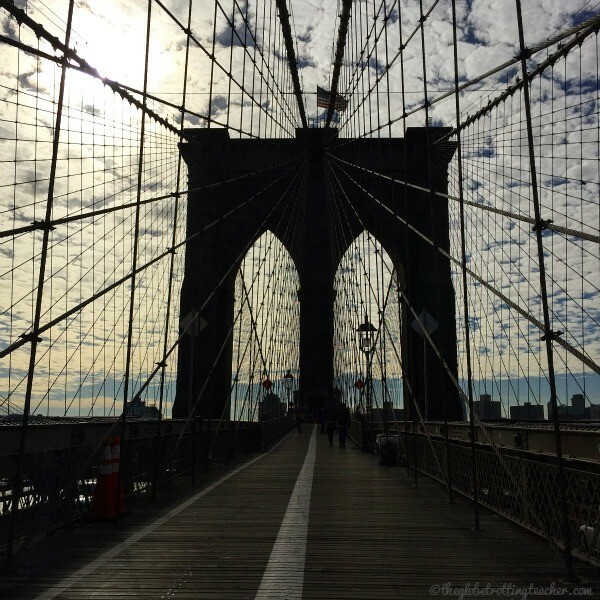 Why not head to lower Manhattan and take a stroll across the Brooklyn Bridge? Head to the Bronx or Queens to see a baseball game. Shop and do lunch in Soho. Go to Smorgasburg in Williamsburg. Browse the antique markets in Chelsea. 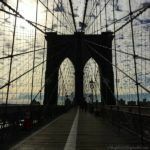 Walking on the Brooklyn Bridge is one of my favorites! Don’t eat in Little Italy. What’s left of this neighborhood is just a couple of streets lined with tourist traps selling cheap souvenirs and restaurants serving mediocre Italian fare. 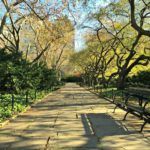 Do walk down Bleecker Street in Greenwich Village and taste delicious pizza, rice balls, and cannolis at the Italian shops lining the street. 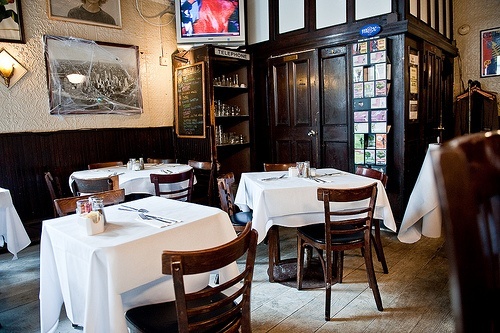 If you want to have an Italian Dinner out, check respected sources like Zagat or Time Out New York for recommendations. Or take advice from a local like me who just likes to eat good food. Some of my favorites are Morandi and Lupa. Don’t be a subway oaf! If this list was ranked in order of importance, this would have the top spot. The fastest way to annoy New Yorkers is to in any way block the turnstiles, the stairways, or the train entrance. And, whatever you do, don’t lean your whole body on the poles inside the train. Do have your Metrocard ready to swipe and know how to use it. Otherwise step aside and let others pass until you’re ready and have learned by watching. And, yes, it’s a petri dish of bacteria, but hold onto the poles inside the train with your hands so other people around you have space to hang on, too. This is exactly why those mini bottles of hand sanitizer were created in the first place. While we’re talking about the subway, I feel obligated to say don’t get in an empty subway car! Ok, I admit. I did this once with a college friend of mine. I was new to New York City and flat out didn’t know any better. Just trust me on this one…unless, of course, you enjoy breathing the foulest stenches in creation. Do move down the platform and find a car with people on it. Your nose and taste buds will thank you. Research and book fantastic hotels on TripAdvisor and Booking.com. Don’t be the cause of a sidewalk traffic jam. New Yorkers’ primary mode of transportation is their feet. 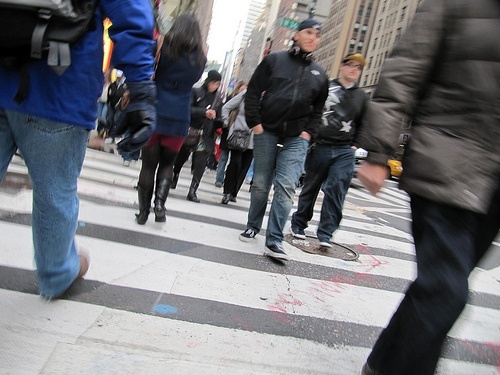 The sidewalk in New York is what you might call the highway or freeway outside of the city. Walking in a line across with your whole family blocks others from passing and whatever you do, don’t make any sudden stops. Do “pull over” to the right if you’re just strolling, are a slow walker, or want to stop and figure out where you are and where you’re headed. Bonus Tip: Whatever you do, don’t take out a map. Look cool and use Google Maps on your smartphone! Don’t act scared! If you can’t walk around comfortably without a death grip on your bag or family members, stay home. New York City really is one of the safest mega-cities anywhere in the world. Do stay alert and be aware of your surroundings. 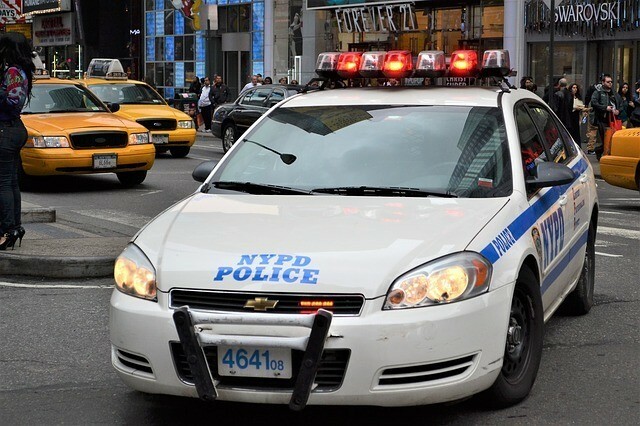 New York City is much safer than it was decades ago, but as with any big city, you need to exercise some basic caution. Don’t drive. Traffic is horrendous and there is no parking. There are no good reasons to justify driving. Do use your feet, the subway, buses, and regional trains for a faster and more mentally healthy way of travel. New York and the surrounding regions are well connected with public transportation. You can get anywhere you’ll want to go and be much happier when you arrive. Don’t pretend it’s spring, when its winter! It doesn’t matter if you’re hot all the time. The streets in Manhattan have a really special way of funneling the cold winter wind right in your direction. It might feel crisp and refreshing at first, but after a few hours of walking around, you’ll be shivering miserably. If this doesn’t like something you can handle, visit NYC in the fall, instead! Do dress for the weather. You’ll be walking outside, a lot. If it’s winter, wear a coat, hat, and boots. If it rains, use a pocket umbrella and watch out for everyone else around you. Two eyes are always better than one! Don’t take disrespectful selfies! It’s sad this makes the list, but crimes, tragic or sad events, homeless people, and the 9/11 Memorial are off limits when it comes to selfies. 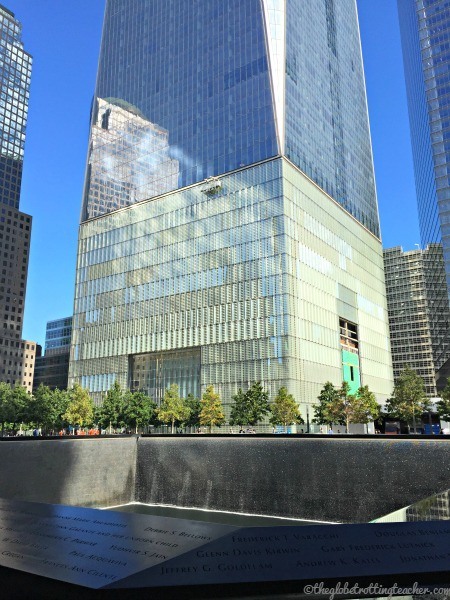 No selfies at the 9/11 Memorial. If you just can’t resist taking another selfie, please do return to Times Square. Don’t eat at a chain or theme restaurant. New York City is home to an unlimited number of incredible restaurants in every cuisine you can imagine. Travel is about getting out of your comfort zone and trying something new, right? You won’t regret skipping the Olive Garden and Red Lobster. 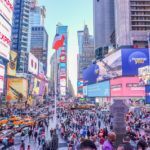 Do walk just 5 minutes outside of Times Square to Hells Kitchen and 9th Avenue for an endless array of good food and drink. Have a bagel with cream cheese from a real New York deli. Find something tasty in a food truck. Have a slice of pizza. Try a new type of ethnic food. Why not try out some Greek at Kefi on the Upper West Side or choose an Indian restaurant in Little India in the east 20s? Don’t wear your souvenirs here. 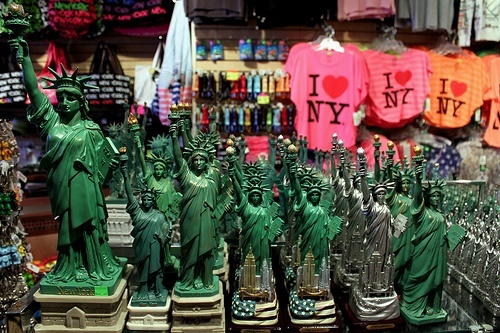 You’re “I <3 New York”, subway line, or Broadway show tee-shirt will be much cooler at home. The green, foam Statue of Liberty crown should only be worn to parties, where the Lady Liberty is the actual guest of honor. Do dress stylishly comfortable. Jeans are always a good start. Boots, flats, oxfords, loafers, and All-Stars are all better choices than your standard sneaker. 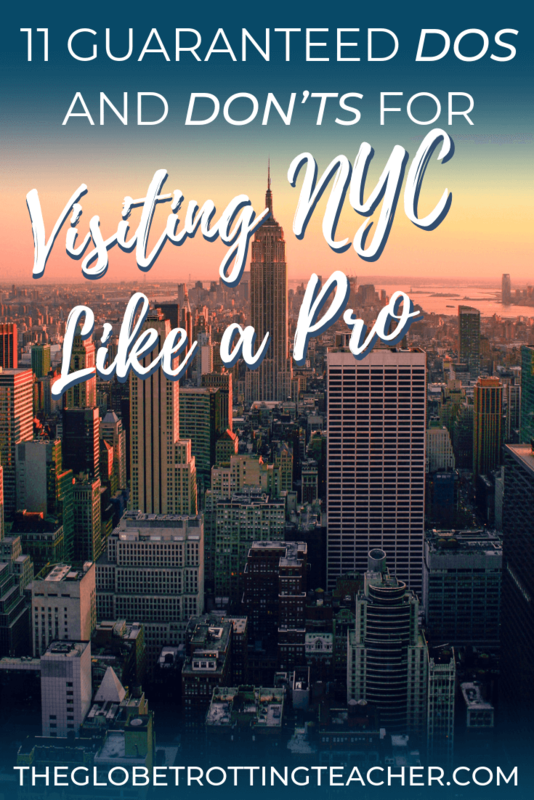 With these dos and don’ts, you are guaranteed to look like a pro on your next New York City visit! 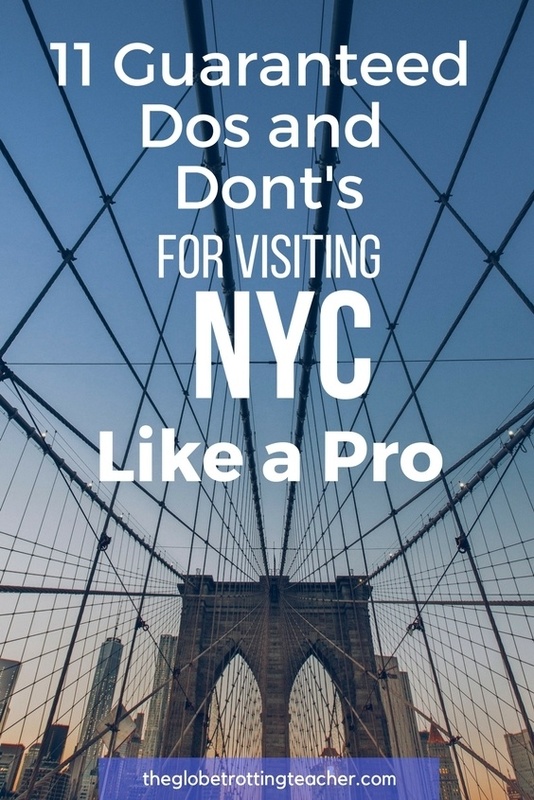 What are your dos and don’ts for visiting NYC like a pro? 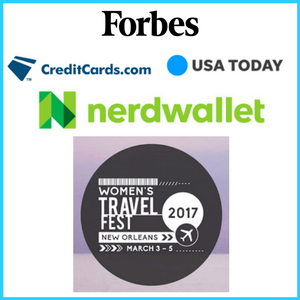 Pin this post to your Pinterest travel board! Love this tip – “Whatever you do, don’t take out a map. Look cool and use Google Maps on your smartphone!” haha. And are selfies ever respectful;?? Great post. It has reminded me that I really need to visit soon! Glad to make you laugh, Dave! I only do selfies when the landscape behind me needs to be in the shot, like when I was hiking in Patagonia. Hope you make it to NYC soon! Great tips. 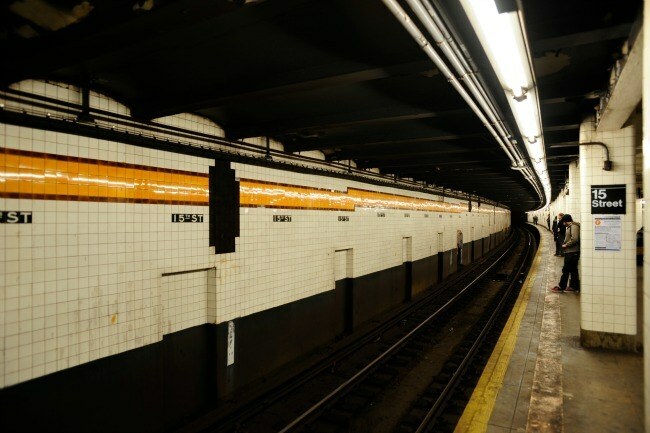 I used to spend summers in NYC growing up, but I have to admit, I’ve never been in the subway (mostly because of that petri dish of bacteria thing). I love your do/don’t format. You’ve given better options for things many tourists would probably want to do. Thanks, Beverly! Local tips can’t be beat! Great tips! We really want to make it back to NYC especially since we were there for such a short time on our last visit. I hate when people stop in the middle of sidewalks too–so frustrating!! And good thing to note about the empty subway cars! I would have probably jumped in one too, haha! Thanks, Jenna! Seems logical to jump in that empty subway car, at first….but, oh how quickly you regret it! Thanks for your comments and hope you make it back to NYC soon! I once was in the unfortunate position of having to drive in Manhattan. To this day that stands as the scariest thing I have ever done. I believe it, Brianna! If you don’t know where you’re going and the aggressive style of the New York driver, then you’re in for a terrifying experience. Dressing for the weather!! Definitely a good tip! I was in NY last winter and almost froze to death!! Great tips. You’re not alone, Anna. Many people visit NYC, and are so used to getting in and out of their cars, they don’t realize how important dressing for the weather is. OK, now I am very afraid I want to know what on earth has happened inside an empty subway carriage. Especially as I gather this is a relatively frequent thing? I would have to take a cab just once I think though. Unless New York taxi drivers are less legendary than they are painted? That would be disappointing. *grins* I am not sure I agree with you about not wearing your souvenirs in country. I see it as an exuberant celebration of how much fun people are having when they are there, and am therefore quite tolerant. I am actually less so when people save it until they get home. What good tips though. Especially about where is *really* interesting to go. Thank you for your comments! If the subway car is empty, it’s typically because someone has become sick, a person who has not bathed in quite a while has taken a nap in there, or someone has used it as a bathroom. While I have a great deal of empathy in my heart for someone in these conditions, I don’t want, nor is it recommended, to ride in that car. I live visiting nyc. Wanted to live there when I was younger but now I think the tourists and other inconsiderate people there would give me too much anxiety. You would have loved it, Laura! But, it can, indeed, be a stressful city. Great tips! I have to remember those for next time we visit. We did not take the subway once when we stayed in NYC for three days, we walked. And we did eat at non-chain restaurants we found near the hotel, and I’m glad of it. And yes, Times Square is a zoo! Absolutely, Sally! I agree with pulling over being a worldwide courtesy. Thanks, Olivia! Good thing for your nose! Great tips! I finally walked across the Brooklyn Bridge for the first time last year and it was one of the highlights of my trip! The Brooklyn Bridge is my favorite too, Elena! It’s such a special landmark. Great tips! We LOVE experiencing the restaurants in NYC. Some of the best food we’ve ever eaten. We often wonder how chain restaurants survive there. Who eats at a chain when there is a plethora of other amazing options! Thanks, Amanda! Those chains survive only from the tourists who never venture outside of the Times Square tourist zone. 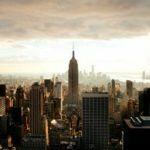 I must say, I read many articles about tips for NYC, this one ranks at the top! Most of the people writing about NYC have visited a few times. You are clearly someone who knows the city well! My biggest tip for any city I visit is to walk like you know what you are doing, even if you don’t. Duck into a store or side street to check where you are going rather than stopping in the middle of the sidewalk! 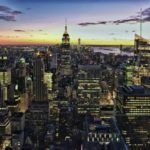 I have been planning a 10 day NYC itinerary for someone going for the first time. She gave me a list of places she wanted to see, and my first thing was to scoff. Times Square, Statue of Liberty, Empire State Building. All these places are the things I was trying to tell her to avoid! But then I had to think like her, a person who has never seen NYC (and not like me—someone who grew up there), and understand that it is OK to want to see those places! They are iconic for a reason! So I guess my biggest piece of advice is that its okay to visit all of those popular tourist places in the city, just know that there is more to the city than Times Square! Do go out and take in a comedy show, especially any of the local clubs that support upcoming talent. Don’t wear sandals, especially if you are going to walk around Manhattan all day. Not only will your feet hurt, but it will take literally days to wash the sludge that built up in between your toes! Do check out Macy’s Thanksgiving Day Parade! It is probably one of the best outdoor festivals that you will ever see in your life. 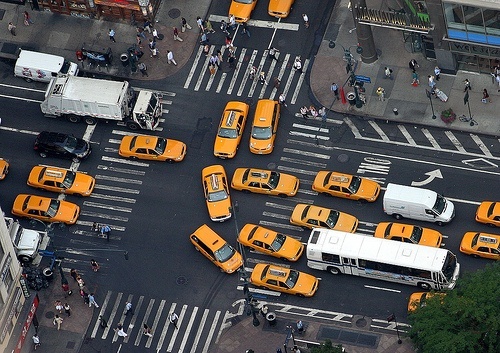 Don’t get caught in the middle of an intersection during a red light unless you are cool with angry New Yorkers laying down on their horn like nobody’s business. Do go to the Top of the Rock to get the best view of Manhattan. Don’t throw objects off the Top of the Rock. You might hurt someone and it’s illegal! Been to NYC four times in my life and this city just gets better every single time! Ray, these are awesome tips! Thanks for helping to make the list even better! Love the point about the sandals and walking around NYC all day and there is certainly no shortage of great comedy shows! Thanks for reading and commenting, Maggie. This is great we are coming over from Australia in March and it is always a bit weird going to a new city! where would you recommend someone to stay? I was looking at the Roosevelt in Manhattan ? Thanks for your advice, what is the best area to stay in that is easy to get around, safe and not overly pricey ? Hi Jackie what a great post and so spot on! I am a former New Yorker, been gone 20 years and I was visiting recently last month. It was so much windier than I’d remembered. It must be the tall buildings creating wind tunnels or something. I don’t remember that for 20 years ago. Maybe the buildings have gotten taller. I would also recommend the Bronx Zoo and the Botanical Gardens which make you feel as if you’re in an English countryside. Thanks for reading, Mary. How great to get back to the city after many years. Great tip about the NY Botanical Gardens. It’s a favorite of mine, especially in fall. Hi Jackie! Thank you for sharing such interesting tips. I will be visiting my Uncle and his family this June and it is my first time to go to US, and I am glad to be visiting New York. However, I do not have any idea what type of clothes to bring. Your suggestions will be very much appreciated. Thanks so much for reading. 🙂 Summers in NYC are warm and some days even, really hot. Sundresses, short sleeve shirts, shorts, capris, elephant pants (loose-fitting pants) are all good. NYers always wear jeans no matter what time of year. As for shoes, NYers wear all kinds of shoes, but we are also used to walking in them. Sandals are fine if they’re comfortable to walk in. Also, there can be afternoon rain storms, so pack an umbrella or pick up one once you arrive. Finally, most places have Air Conditioning, so sometimes a light sweater or sweatshirt comes in handy! Hope that helps, Faith. 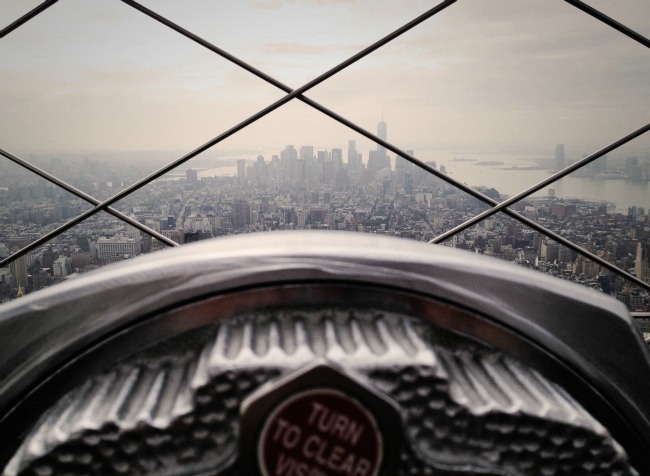 If you’re looking for more first-timer NYC tips, check out this post. Enjoy NYC! This is a great list, except that blocking people in the subway is absolutely not “the fastest way to ingratiate yourself with New Yorkers.” It is, in fact, just the opposite since to ingratiate yourself means to bring yourself into favor. This is a great post love all the tips. I am traveling there soon so will be very handy. Thanks so much for reading. Glad the tips will be useful. Great post. I am a travel and sports blogger who was born and raised in New York City , even though I lived in other places. I would definitely recommend that tourists check out the Outer Boros. Take a ride on the Staten Island Ferry , which is free. 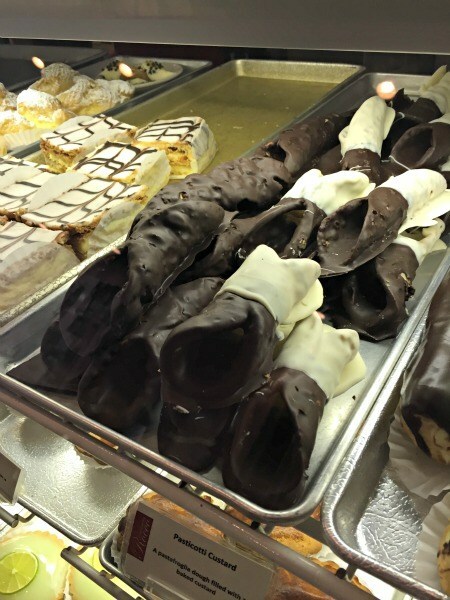 See the real Little Italy on Arthur Avenue in the Bronx. See the Queens Zoo as well as attending a game at either Yankees Stadium or Citi Field . See the other Chinatown in Flushing. Have some Asian, Indian or Latin American food in Jackson Heights . 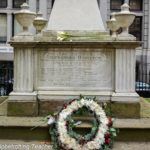 Visit Grants Tomb or Alexander Hamilton ‘ s home Hamilton Grange in Harlem. 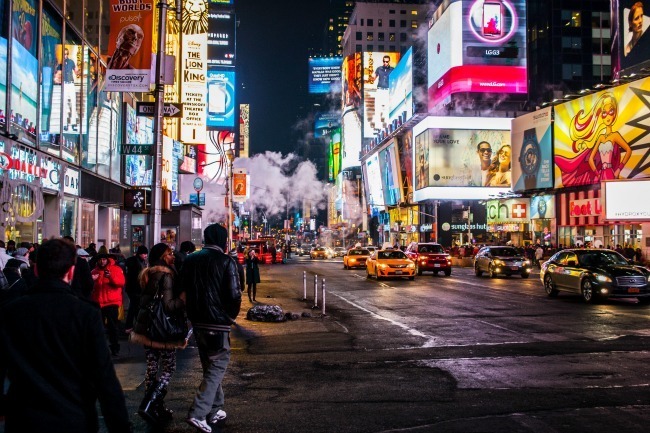 There is more to New York City than times square . Also, please tourists , don’t take a picture of the rats on the subway. They’re just like their human New York City cousins , aggressive and in a hurry to get to the train. Thanks for reading, Jo Ann, and for all the tips! You are soo right about getting to the outer boroughs. I’ve included many of these in my 100 things to see and do in NYC. 🙂 Love that last bit about the rats. They’re definitely camera shy! NY is like a dream city to me. Thanks for the o do list and not to do list. Great. Thanks. Hi going to New York for the first time late June for 4 nights then heading to upstate for a wedding. I’m getting freaked out because I’m disabled with visual and balance disabilities. So with that in mind do I stay in Manhattan and cab into the city for getting a feeling of NYC? I walk slowly and afraid of getting bumped around. 4th of July holiday Yikes what have I gotten myself into!? !